Myc cancer gene empowers tumor cells to relentlessly divide but simultaneously, provokes a cell suicide process called apoptosis. Myc controls cells by commanding the expression of every tenth of the genes in the nucleus of a tumor cell. However, in spite of more than two decades of intense research, no Myc motivated killer genes have been found. A team of researchers from the University of Wurzburg, Germany, and the University of Helsinki, Finland, discovered that searching Myc motivated killer genes is akin to barking up the wrong tree. The new findings suggest that Myc makes cancer cells vulnerable to cell death by repressing well-being genes, which are essential for maintaining the life of the cells. Myc is a high-ranking transcriptional commander, which occupies the controller sites of thousands of genes in the genome. It works together with its closest partners, Max and Miz-1, to turn on and off genes, which produce mRNA and then new proteins. These new proteins take care of the cell's energy metabolism and cell division program, and even command cells to die when needed. In cancer, Myc levels and its power becomes overwhelming and the cells start to divide wildly and refuse to die, leading to rapid growth of a tumor mass. Professor Martin Eilers, from University of Wurzburg and his Ph.D student Katrin Wiese had been working with an experimental mutant version of Myc, which collaborates with Max but refuses to work with the partner Miz-1. These experiments revealed something truly exciting about Myc. Katrin Wiese explains, "Our mutant Myc turned on genes without a hitch but it had difficulties to turn genes off. Even with this handicap, mutant Myc was able to instruct the cells to divide but it could not instruct the cells to die". Only after these experiments, the researchers realized that a long cultivated idea that Myc kills cells by turning on some killer genes may not be right. Instead, Myc could kill the cells by turning off such genes that cells need to sustain their lives. To find out what these well-being genes could be, Wiese and Eilers teamed up with Dr Juha Klefström and his Ph.D student Heidi Haikala, working at the University of Helsinki, Finland. The Finnish researchers had used a set of "gene wrenches" called RNAi molecules, to turn off genes of interest, and with these additional experiments the researchers identified tracks leading to a nuclear protein and gene controller protein called SRF. "It seems that in cancer cells, Myc and its partner Miz-1 invade to gene controller areas where they are not supposed to go. In this situation, Myc and Miz-1 disturb genes, which cells need for their well-being", tells Heidi Haikala. "The well-being genes, when not disturbed, supply cells with bioenergy and nestling connections with other cells. 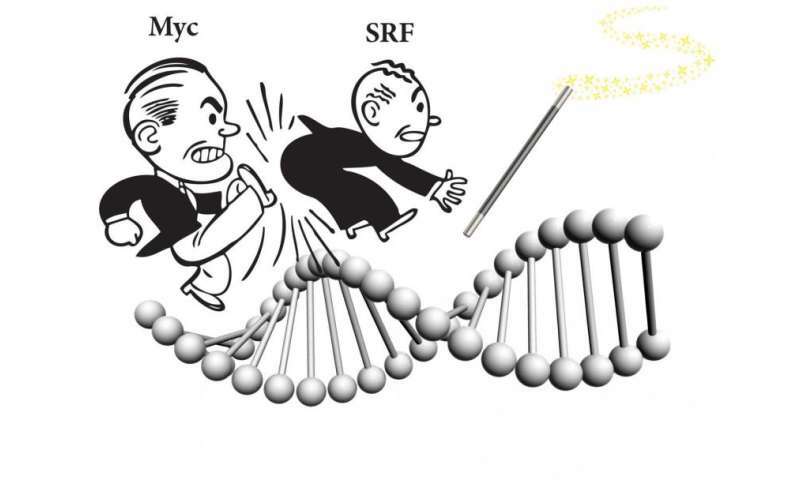 Myc and Miz-1 proteins especially collided with a gene expression controller protein called SRF and, we believe that this clash in the nucleus brings down the well-being genes and makes cancer cells suicidal." Can these cell death pathways and reactions be exploited in cancer therapies? The senior researchers of the study, Martin Eilers and Juha Klefström are excited about the concept that Myc's ability to turn off rather than turn on genes is a key to cell death: "It is much easier to bring cellular activities down than up with the existing drugs. These new findings suggest that a drug that brings well-being gene activities further down could significantly boost the killer activity of Myc in tumor cells." The study will be published in EMBO Journal 20th April.